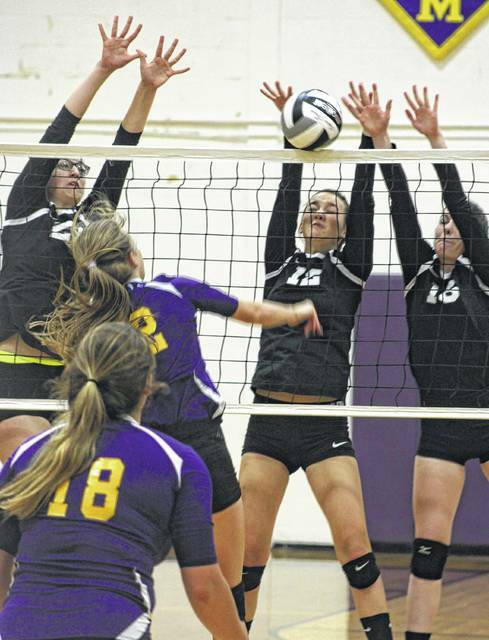 GREENFIELD — The Miami Trace Lady Panther volleyball team traveled to McClain High School Thursday for a Frontier Athletic Conference match against the Lady Tigers. Miami Trace won, 27-25, 25-21 and 25-22. For Miami Trace, Erica Marshall had seven kills and four blocks. Kate Leach had three kills, two blocks and one ace serve. Taylor Dawson had three kills. Miami Trace will play at Hillsboro on Tuesday, Sept. 12. Miami Trace’s Sidney Howard, Kate Leach and Taylor Dawson (l-r), combine for the block during a Frontier Athletic Conference match against the McClain Lady Tigers at McClain High School Thursday, Aug. 31, 2017.
https://www.recordherald.com/wp-content/uploads/sites/27/2017/09/web1_MT-volleyball-at-McClain-8-31-2017.jpgMiami Trace’s Sidney Howard, Kate Leach and Taylor Dawson (l-r), combine for the block during a Frontier Athletic Conference match against the McClain Lady Tigers at McClain High School Thursday, Aug. 31, 2017.